They're finally here! 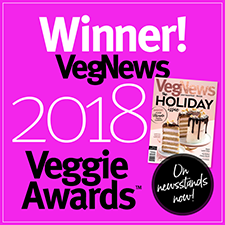 Vtopian's amazing artisan vegan cheeses are dairy-free and handmade with natural and organic ingredients, which creates some of the most amazing options available for cheese alternatives! Perfect for cheese platters, putting on crackers, topping off sandwiches or bagels, or even just on fresh bread, you can't go wrong with Vtopian's complex and rich flavors that meld perfectly with the smooth texture that tantalizes your palate with each bite. Vtopian cheddar cheeses are available in 2 delicious varieties: Aged White Cheddar and Spicy Cheddar. 5.5 oz. (156g) blocks are $14.99 each. From Laura Posner of Pittsburgh, Pennsylvania on 9/20/2015 . I found the white cheddar to be cheesy, buttery, and satisfyingly delicious on crackers. My only qualm is that it did not remind me of white cheddar; it was slightly soft (though able to be cut with a knife) and was tangy but not with the depth of an aged cheddar. Loving this cheddar to pieces!!!!!!! From Leeza Coleman of New York, New York on 1/26/2015 . This fantastic cheese is everything I could want - I simply love it. I have eaten it with cherry tomatoes on the vine, with grapes, apples, pears, nectarines and melons --- more to come. I love the flavor, texture, feel on my palate and the lingering flavor. Great cheese! Kudos! From Heather Moorman of Owensboro, Kentucky on 12/15/2014 . 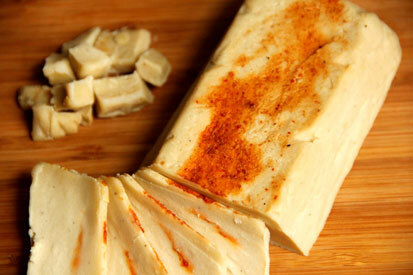 This is the first vegan cheese that actually taste like cheese!! It's so delicious!! I've used it as a spread on crackers, slices on a tofurkey sandwich, and melted on a baked potato!! Absolutely devine....my go to cheese! From Anonymous of West Bend, Wisconsin on 9/17/2014 . I've tasted both the aged white cheddar and spicy cheddar. Both cheeses are extremely creamy, smooth, and have a subtle tang with buttery finish. The spicy cheddar has a nice chili-spice like finish, but nothing spicy like what you get with sriracha or other hot sauces. The aged white cheddar was on the buttery side, but not like the company's brie. As with this company's brie cheeses, a little goes a long way for me. I just eat a thin sliver, and I feel satisfied. 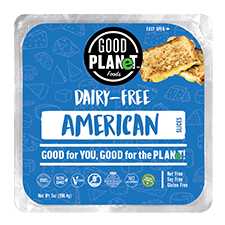 I enjoy this cheese plain but it's also nice on a sandwich. While it says there are about 6 servings per package, I think I can easily stretch it out to 20 servings. I don't find this cheese expensive because the quality fits the product. From Karin Bartimole of New Rochelle, New York on 7/3/2014 . Creamy, tangy, tasty - oh so good! Does it taste like cheddar cheese? Not exactly, but it truly satisfies that cheesy goodness. My cheese eating husband really likes it. Sliced and topping your favorite veggie burger/hot dog is a really good use, but it stands strongly on it's own as well.